Members of Alpha Gamma Rho received the Most Sustainable Shack Award from the Office of Waste Reduction and Recycling (pictured on left) and NC State's Habitat for Humanity chapter (pictured on right). Shack-a-thon is an annual student-led fundraising event for the Wake County chapter of Habitat for Humanity. Student groups sign up, build a temporary “shack” for a week and raise money. 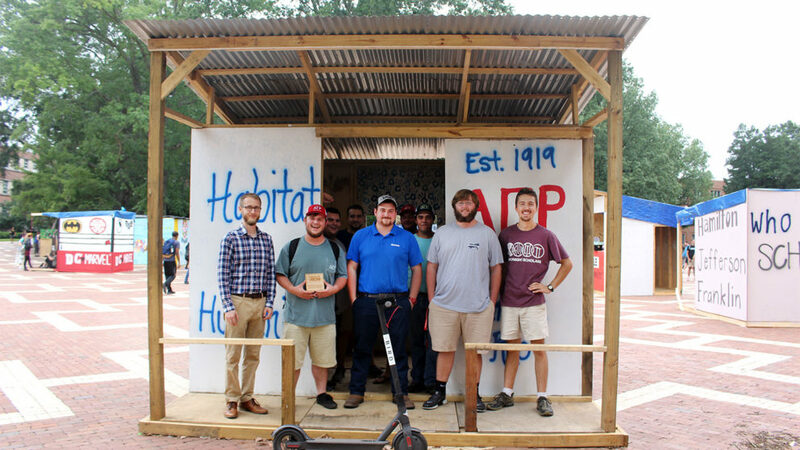 The winning shack, built by Alpha Gamma Rho, is made from salvaged material that was donated. This is the second year that Alpha Gamma Rho has reused the structure. These reuse efforts not only save money but result in fewer discarded materials after the event. Published in News, Students, Waste Reduction.